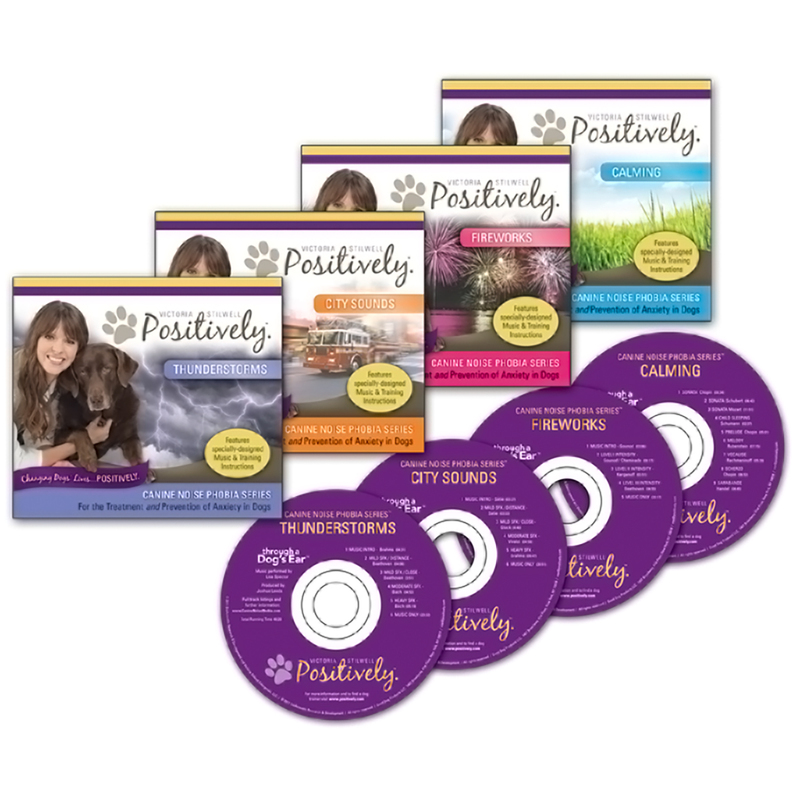 Victoria Stilwell’s revolutionary Canine Noise Phobia Series is a 4-CD compilation of specialized audio recordings and innovative training protocols specifically designed to reduce and prevent noise phobias and anxiety in dogs. In conjunction with the founders of the acclaimed Through A Dog’s Ear canine music series, Victoria has developed a groundbreaking new treatment for several commonly-found triggers of canine anxiety, including Thunderstorms, Fireworks and City Sounds. A 4th CD, Calming, is a powerful tool which can be used to reduce the stresses suffered by anxious and noise-sensitive dogs, and is effective in applications ranging from separation anxiety to excitement with visitors and reactivity. The dog first learns to associate positive feelings with the music on the CD. Once he is calm and relaxed, specific sound effect noises (fireworks, thunderstorms, and city sounds) are slowly introduced alongside the music at gradually increasing levels while the owner continues to provide positive experiences. Eventually, the dog is able to function normally despite the presence of a previously offending noise or sound. The Through A Dog’s Ear music on Calming is intentionally selected, arranged, and recorded to provide easeful auditory assimilation. Three primary processes are used to accomplish this effect: Resonance, Entrainment, and Auditory Pattern Identification. To learn more visit www.CanineNoisePhobia.com. Each CD includes Victoria’s detailed training instructions in a 24-page booklet. By combining progressive sound effects, the specially-designed psychoacoustic music of, and Victoria’s reward-based reinforcement protocols, the Canine Noise Phobia Series is an innovative desensitization tool that not only helps reduce the anxiety suffered by noise-sensitive dogs, but also reduces the likelihood of common sound phobias or general anxieties from ever developing. Fear. (n) An unpleasant emotion caused by the belief that someone or something is dangerous, likely to cause pain or is a threat to survival. Phobia. (n) A persistent, abnormal and irrational fear of a specific thing or situation that compels someone to avoid it despite awareness and reassurance that it is not dangerous. Through a Dog’s Ear sets the standard in the field of canine music therapy. Co-founded by psychoacoustician Joshua Leeds and concert pianist Lisa Spector, Through a Dog’s Ear music has been clinically demonstrated to reduce canine anxiety issues and is used in shelters, dog rescues, and animal facilities worldwide. For more information visit www.ThroughADogsEar.com.